A young entrepreneur is hoping to prove her forte in the world of business with her inaugural venture – the launch of a novel record label to promote Islamic musicians. 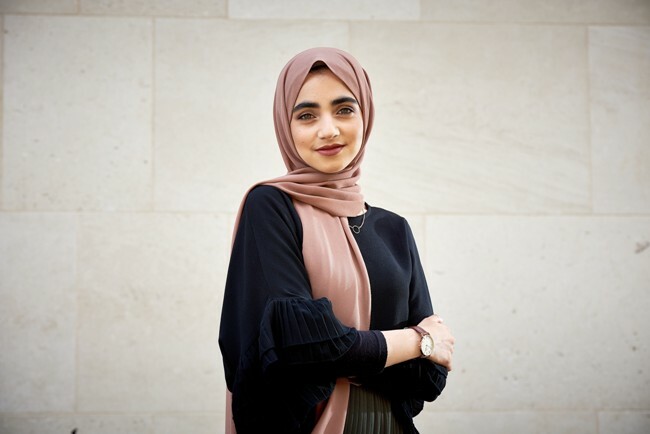 Safiyyah Hafiji, aged 20, who lives in West Yorkshire, has set up the world’s first record company focused exclusively in A Cappella nasheeds and other vocals-only faith music. Now she is setting her sights on unearthing chart-topping singers in the 2.6 billion Muslim community by launching a global talent-spotting contest – and signing the winner to her label. The budding music impresario was awarded an entrepreneurial scholarship from the University of Leeds, where she is a third-year Management with Marketing student, to bring her idea to life and fill a gap in the music industry. Now the former Batley Girls’ High School pupil has swapped her business pitch for a musical one, after establishing her Enlighten Records label. Her business inspiration grew out of her passion for A Cappella faith-based music – wedded to a determination to break down barriers and make it more inclusive and accessible to all. Safiyyah said there were very few, if any, Muslim women working in the Islamic music industry, and that there was only one prominent global Islamic music label, yet it only records largely traditional music by men. “A Cappella inspires, unites and spreads joy – and brings people together. Thanks to its purity,it is a very much an in-demand musical genre,” she said. “There is no lack of singing and songwriting talent that is deserving of a wider audience. But there is a shortage of channels to promote it far and wide. Our aim is to promote this talent and open up a platform for this spiritually-uplifting music to be enjoyed by everyone around the world. We believe that the voice is the best musical instrument, with vocals-only spiritual music letting it truly shine. To mark the launch, Safiyyah is staging an A Cappella or vocals-only worldwide singing competition to capture this hidden musical talent – with the winner securing a record and promotional deal with her company. “This is a rare opportunity for people to win a record deal – and let the world hear your voice,” she said. One of the unique strands of the competition is that music produced by females will only be shared with female audiences, thereby encouraging more talent to come to the fore. She has enlisted the expertise of two renowned names in the music industry to join her on the judging panel. They are music engineer and educator Lee Bloomfield, who works as a lecturer at Leeds College of Music; and Damian McDonald, a Yorkshire-based singer, songwriter and multi-instrumentalist, whose creations have featured on the soundtracks of TV shows such as MTV’s Real World and Hollyoaks and several films. The online competition is open to male and female soloists, male and female duos, male and female groups, senior singers, and singers aged 18 and under.